A treasury of practical mental strategies to empower your riding. 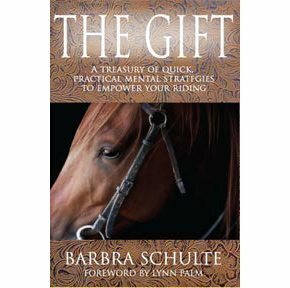 Schultes new release, The Gift, is divided into nine sections that contain seventy-two articles packed with practical, powerful ideas to help a riders mental game. For six years, Schulte wrote monthly confidence-training articles for The American Quarter Horse Journal that were inspired by her experiences as a Personal Performance Coach certified by LGE Performance Systems, knowledge gleaned from favorite mentors and personal life experiences. The book is an easy, inspiring, practical read and because each article stands alone, they can be read in any orderstart at the front and read it all the way through or peruse the table of contents for something that looks interesting or addresses a current need or simply open it up anywhere. Schulte says, This is intended to be a to-the-point, how-to-think-and-how-to-feel book to help improve your riding. Some ideas may even spill over into your personal life.